The Heritage Lottery Fund (HLF) has approved a £382,000 grant to fund the refurbishment of a 1930s lido. Sandford Parks Lido, in Cheltenham, retains nearly all its original details and is one of the most complete examples of its kind in England. The grant will fund the complete revamp of the outdoor pool and provide a range of educational activities based around the lido. A HLF spokeswoman said: "Lidos are extremely popular with young and old." 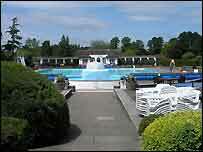 She added: "The HLF money will go some way to address the current lido crisis. "At their peak in the early 1950s there were over 300 lidos and open-air swimming pools in Britain. Now, barely 100 remain." Janet Smith, author of Liquid Assets, said: "We have to do our utmost to ensure that the remaining 100 pools continue long into the future."